SIHH 2013 Preview Baume & Mercier Clifton is a new collection of watches that next year will mark the focus of the brand in mechanical watchmaking. This is a new line of classic timepieces designed for the city, but for their style recall some models Hampton. This includes the Clifton 1830 (ref. 10060) with red gold case 18 k driven by a mechanical movement manual and two references 10052 and 10053 instead fitted with two automatic gauges. The top model is equipped with a manual winding caliber of workmanship in a 18 k red gold case forms very simple and traditional: it refers to a historical example of a brand that has served to inspire the entire watch collection Clifton. For practical purposes today in a mechanical timepiece is usually opt for the automatic charging, is not always made the choice of who is rooted in the most traditional of the origins of watchmaking. With its softened curves and straight lines, Baume & Mercier 1830 Clifton, simple and elegant watch, blends perfectly with the wrist. It has been specially created to celebrate the close relationship that a man has with this timeless instrument. It ‘a beautiful example of design, classic and balanced, but with dimensions journals to meet the modern trends. It ‘a discrete clock that does not reveal anything about what makes it different. For this reason, it will be the choice of those who appreciate sophistication in the office and will accompany its owners in all the important moments of their lives. This watch is considered the reference collection Clifton. It has a diameter of 42 mm and is made from an ingot of 18 carat red gold. The case shows evidence polished and satin finishes. Baume & Mercier 1830 in Clifton that will be presented at the SIHH 2013, the dial is curved to match better with the sapphire crystal “Chevee”, identical in form to the acrylic typical of vintage watches. Fine and deliberately simple, this watch is equipped with a gauge adapted for Baume & Mercier by Joux-Perret Manufacture. Once its barrels are fully charged, this exceptional mechanical movement ref. 7381 has a power reserve of 90 hours. Visible through the transparent case back has all the features necessary to enable them to cope with the passing of years without becoming obsolete. Each element has been optimized in order to avoid any problems, including the rocker arm which oscillates at 21,600 vibrations per hour. With its meticulous finishing, and worthy of chronometers which in the past have amply demonstrated experience watch by Baume & Mercier, is the pride of the watchmakers who created it and so will its owners. The bridges are decorated with Cotes de Geneve, the bottom plate is finished with perlage and blued steel screws are also clearly visible through the transparent case back with sapphire. 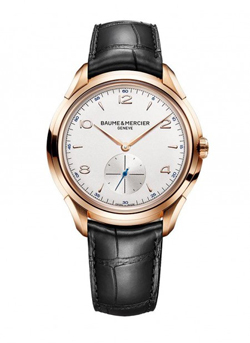 The case of Baume & Mercier Clifton 1830 in 18 carat red gold is water resistant to 50 meters. More new Pre SIHH 2013 collection are two models Clifton Automatic with stainless steel. Although this series of watches is produced in greater quantities than the Clifton 1830 the Maison Geneva has used the teachings collected in his long experience to apply them to production processes. The job of generations of watchmakers was transported in these timepieces, from the production of stainless steel made with long and traditional processes, the processing of the dial, including the installation of automatic mechanical movement on the bench of a skilled watchmaker. 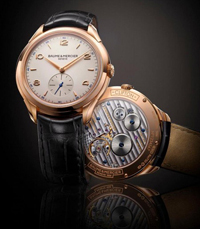 At SIHH 2013, its fashionable look will be enclosed in a box of 41 mm in diameter and inspired by the traditional forms of the models built by Baume & Mercier in 1950. Clifton Automatic is a watch of lasting value. The round case, with curved handles and thin to perfectly follow the wrist has, it is true, a profile a little ‘formal. But in an era in which the predominance of disposable too often excluding attachment to the things that surround us every day, it’s nice to be able to revise the search for these values. Traditionally presented with a black alligator strap and triple safety clasp clasp, the pattern is adorned with a silver dial decorated with Arabic numerals and indexes. Finely balanced, the traditional look of this watch, water resistant up to 50 meters, is highlighted by the presence of blue steel spheres that read the rhythm of a mechanical self-winding Calibre vibrating at a frequency of 4 Hz Visible through the transparent back, his heart is equipped with an oscillating weight decorated with “Cotes de Geneve”. Professionals say that the dials give blacks to give the watches a martial appearance. This is because in most of the watches built to be used in war, the predominance of this color was used to remove the hands on the dial, making them more readable. In this case, the black color of the face of the watch Clifton Automatic need to give him a presence a bit ‘stronger, highlighting its “robust” that does nothing but confirm subtly its dynamic nature. Presented with a brown alligator strap, this timepiece with a stainless steel case 41 mm, as well as at law the small seconds at 6 o’clock and a date window at 3 o’clock. It ‘also driven by a Swiss-made movement with automatic winding of some components, such as discrete finish oscillating weight are visible through the transparent case back. The watch collection Clifton is a preview of the Salon International de la Haute Horlogerie SIHH 2013.